Until six years ago, I’d never heard of the term “boutique hotel.” And then I entered the world of travel blogging. I attended FAM trips and press trips and many times those trips skip the cookie-cutter lodging options in favor of a more intimate or unique property. It didn’t take long for me to decide I adore boutique hotels. But what exactly is a boutique hotel? According to a definition I found online, a boutique hotel is a small stylish hotel, typically one situated in a fashionable urban location. Boutique hotels are typically smaller properties which lead to a more attentive staff and intimate atmosphere, full of personality. They are often found in refurbished city buildings and feature an eclectic, modern or designer décor with original artwork and architectural details. This is true of the St. Paul Hotel situated in downtown Wooster, the area’s newest and most unique hotel. This 12 guest room property features outstanding service and luxurious rooms, perfect for those who wish to ditch the car and explore the downtown restaurants, pubs, and shopping venues on foot. You can get some ideas of things to do in the area from this post; Downtown Wooster, a City Full of Surprises. 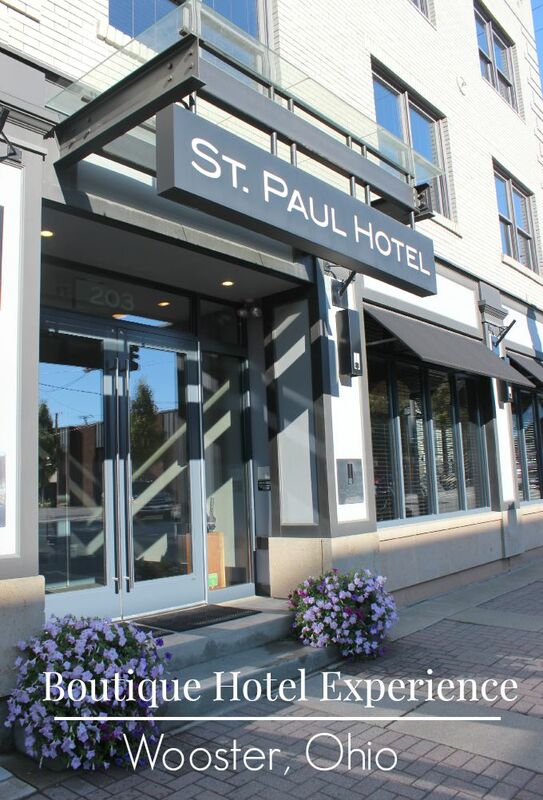 Home of the original St. Paul Hotel until the 1970’s, this property has undergone a complete renovation to feature a fresh, sleek and modern design, an asset to the hospitality industry in northeastern Ohio. 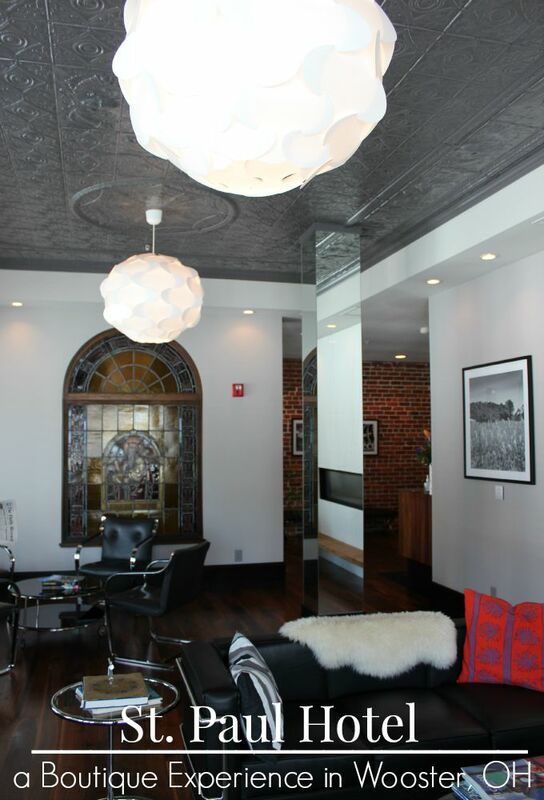 Exposed brick walls were left intact when possible and an elaborate tin ceiling, found under layers of drop ceiling, was carefully restored to grace the lobby. Another unique feature is the stained glass window in the lobby. Found in a local antique store, the window bears the inscription “St. Paul O.P.N.” making it a perfect addition to the property. 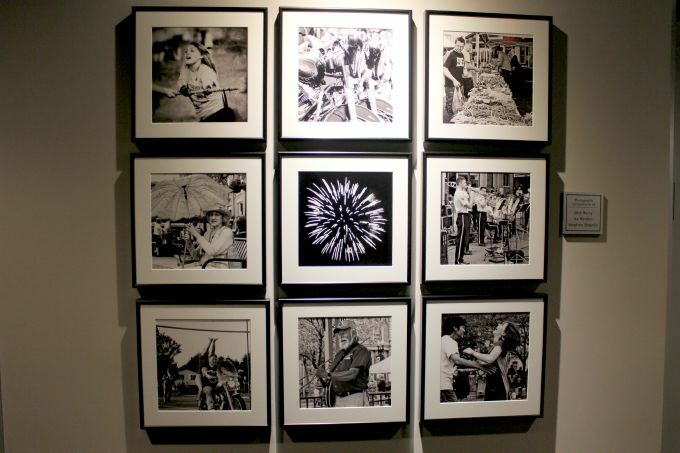 The hallway walls are decorated with black and white photos of people and places in the community. The luxurious guest rooms contain modern furnishings with custom black walnut beds, dressers and desks made by the Schantz Organ Company in nearby Orrville. 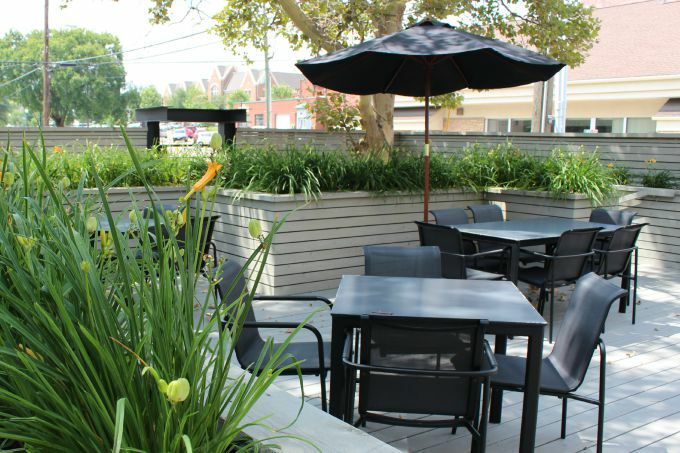 I stayed in a Luxe Suite which featured a corner room with views of downtown Wooster, a queen bed, sitting area, wet bar with free soft drinks, coffees and teas, perfect for a mid-week or weekend getaway. The bathrooms feature heated Italian tile and impressive shower with a rainforest shower head, wall-mount shower head and hand-held wand. Lavish Tommy Bahama toiletries are provided. My suite also had double sinks and an LCD TV. Check-in was a breeze and I was warmly welcomed and asked if I needed assistance finding my room. 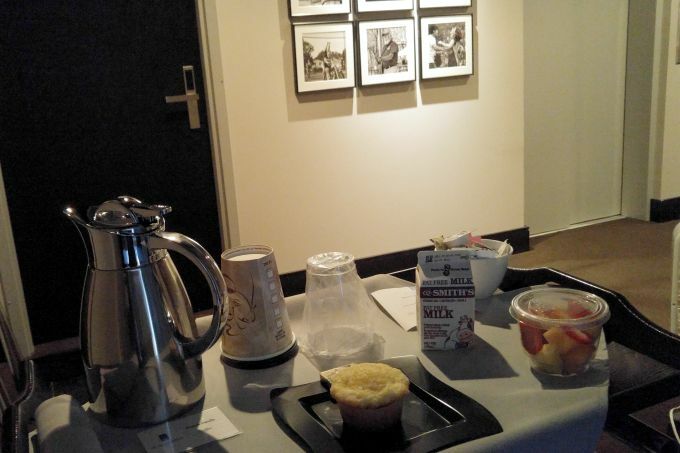 A breakfast of specialty coffee, juices, fruit and a perfectly warmed lemon muffin were delivered to my room at the precise time I had requested. I didn’t have time to use it, but the hotel also offers a fitness room and a shaded back deck with private seating for guests to relax. My stay at the St. Paul Hotel was incredible. I hope to return with my husband to stay in the Grand Suite which offers a separate living room, window seats, private deck and hot tub. How lovely does that sound? But if you’re traveling with family, deluxe double rooms with two queen beds are also available. If you’re looking for more ideas of what to do in Ohio, don’t miss my Ohio Bucket List post! It has a ton of ideas to keep you busy for the entire year.